Units fabricated of 18-8 type 304 stainless steel with exposed surfaces #4 satin finished. One piece seamless 22 gauge ((.8mm) flange provided with 1/4" (6mm) return for rigidity. 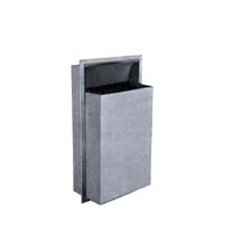 Waste receptacle is 22 gauge (.8mm) and secured to cabinet with tumbler lock and is removable for servicing. Hemmed top and bottom edges for safety.